So we are talking about a vehicle that WAS a van, but is NOW a passenger carrier, that weighs under 2 tonnes. Like an 8 seater mini bus. We are not talking about commercial vans or cars or anything in between. As they are "Light Goods vehicles" which weigh under 3.5 tonnes. Although we have "Multi-purpose vehicles" ... yet that term is somewhat abstract as a "Motor car" can be used for multiple purposes in the legislation to carry goods or load of any description, or passengers, and their effects. Also many vehicles are insured for multi-purpose use both buisness and domestic pleasure use. From motor-cycles to cars and vans and even HGV that people have as a personal car, or a camper van home. The "Motor Car" meaning clearly includes the majority of "Light goods vehicles" and they are absolutely not 7.5tonne goods vehicles which are "Heavy motor cars" (HGV) - Heavy goods vehicles. Speed limits on Dual carriageways are different for various classes of vehicles. adds confusion to the matter by drawing attention to a weight of 2 tonnes for dual-purpose vans that are car-derived. Yet the actual schedule 6 itself (which you links to) uses only the unladen weight of a motor vehicle to apply any speed restriction. Also The Road Traffic act 1988 section 185 clearly defines a CAR is a vehicle which is designed to carry a load, or passengers and does not exceed 3.05 tonnes unladen weight. This is what the schedule 6 is based on. In addition to this, the amendment of the motor vehicles (wearing of seatbelts) regulations 1993 -10- (2) has been inserted that "light goods vehicle" means a motor vehicle which (c) has a maximum laden weight not exceeding 3.5 tonnes. You do in the schedule, note the "meaning" of dual purpose and car-derived vans, but this is pointless and not applicable to an actual VAN by the schedule tables specifications and given criteria. You also lie on your government advice page, which confuses the authorities and Highways departments and police forces. 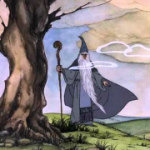 Schedule 6 speed restrictions are not applied to motor vehicles which are beneath the unladen weight range and lengths. The only mention in the schedule 6 restrictions of goods vehicles and dual-purpose van's is to clearly omit those from being included with lorry's, HGV and heavier "goods vehicles". a regular van, which only has an unladen weight of 2.265kg and is under 12 meters in length, is designed to carry a load. And passengers, and is insured for multi-purpose use is simply a "Motor vehicle" which is in all specifications and sizes the same catergory of vehicle as a car. And the actual speed restriction chart in schedule 6 - speed limits for vehicles of certain classes - does not use the laden weight or gross weight when applying the restrictions to vehicles. It only omits "dual -purpose vans" from having the 7.5 tonne maximum gross weight category "applied" to them in the schedule, which it is the only place they are mentioned. Yet there are certain Road traffic authorities who still argue this and add confusion to the clarity of the matter. Thus i require HM Government to officially confirm that the van i drive is subject to the very same speed limits as a car. Here is where it makes all the clarity if you look correctly..
What they are doing is saying that.... the weight used for cars & light vehicles and even vans which carry goods, will be its KERB WEIGHT. Not its GROSS weight, as with HGV and Lorrys, and heavy vehicles. 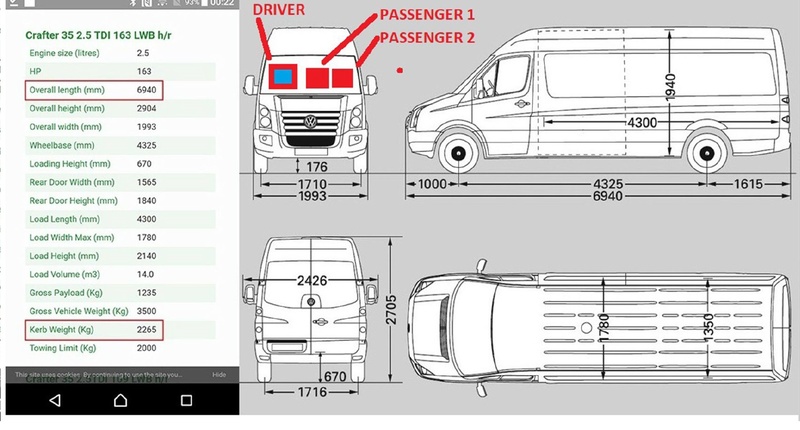 With the understanding that ALL motor vehicles which have a listed KERB weight.... will all have a MAX PAYLOAD which is unique but plated and that it is likely to not be too large, (most likely about 3.5tonnes) unless it is "overweight" which is an offence and will result in a fine. I would suspect that the police do not like this as they would have to go around counting seats and weighing vehicles.. and its not practicle to do that with speed guns and cameras.. 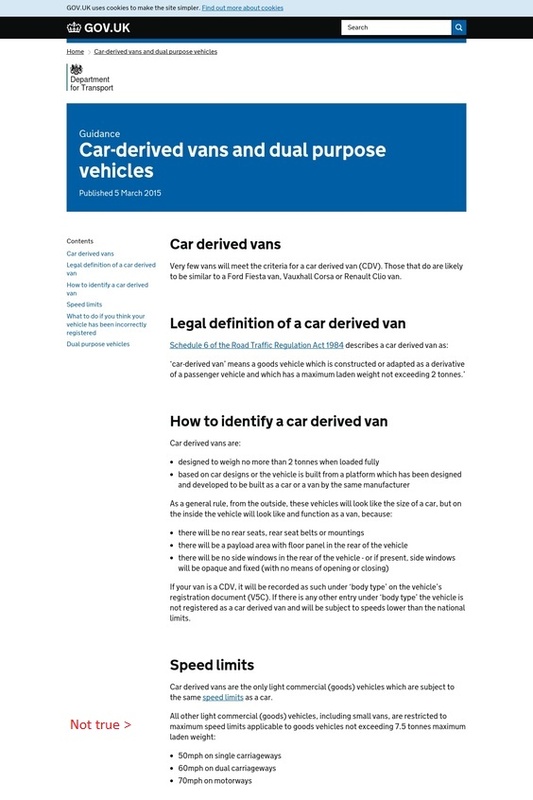 This van, by the legislation, has the same speed limit as a car and is the same catergory. So the question is, why are the government lying on their advice pages? So i have been to speak to the Highways England office in Leeds over this. And they agreed i am right about it. I have tried to Speak in Person to the Manchester office ( Chris Lomax complaints department ) but they were on lunch. I also went into London on Monday afternoon to the Deparrment for Transport headquarters on Horseferry road. And DID get to see somebody in person who came from Risk department to talk to me. Listened to my concerns and took my details.. to pass to the appropriate person. Looks like i have an email to further discussion.. but i cant stand letters and email correspondence..
My petition got sent for checking as well last night..
Its likeley that they will refuse to cooperate and comply with or process that. And at that point i will fully acknowledge that the system is corrupt. 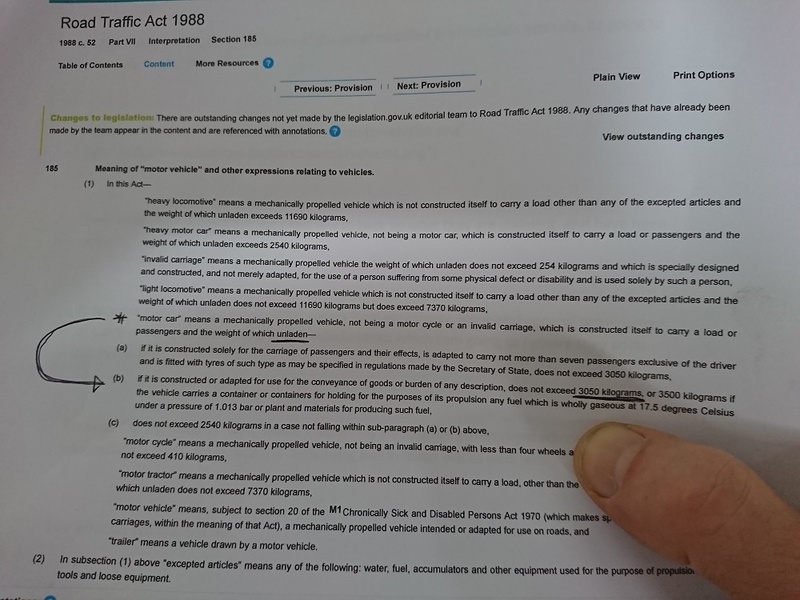 Just been into the "central licensing office" in Leeds.. that deals with licensing for HGV and they are familiar with this section of legislation in question.. or the parts that deal with lorrys.. and that shares part of the National Speed limits schedule 6 and Road traffic act 1988.. where vehicle specifications are laid out..
And the guy there i spoke to says i am reading the section correctly and understand it. And the vehicle i drive is deffinately a light vehicle. And he agrees with what i have said about the van being a motor car. But there might be some changes coming in the future though! Oo dear. Lol. I hope not tachographs! I need to note that the car derived vans and dual purpose vehicles does say a vehicle under 2tonnes is subject to that name... 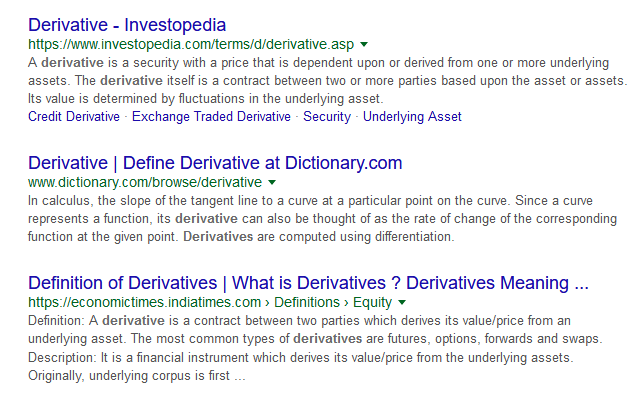 But it does not override section 185; 1. (b) of the Road Traffic act 1988 and say that a 3.5t maximum gross weight van with a kerb weight of 2.2tonnes, under 12meters long.. is not a "motor car". And cars not towing... With only 2 seats.. even carrying goods are not subject to schedule 6 restrictions. The term "Light goods vehicle" under 3.5toness mgw also does not stop a van being a car or car derived van... Which would not therefore subject it to schedule 6 under the 7.5t mgw under 5; 1 and 2. And a,b and c.
So its absolutely a motor car, and a car_derived van of light goods vehicle spec which still leaves it deffinately a motor car still. And not in the _upto 7.5tonnes goods vehicle catergory at all. It is infact excluded from that catergory. So the speed limits are the same as a car. Its NOT a HGV or a 7.5t goods vehicle class, anyway.. for certain. The "light goods vehicle" absolutely seperates the 3.5t mgw van from the 7.5t mgw lorry and the HGV. Also it groups the van with all other vans and car derived vehicles.... 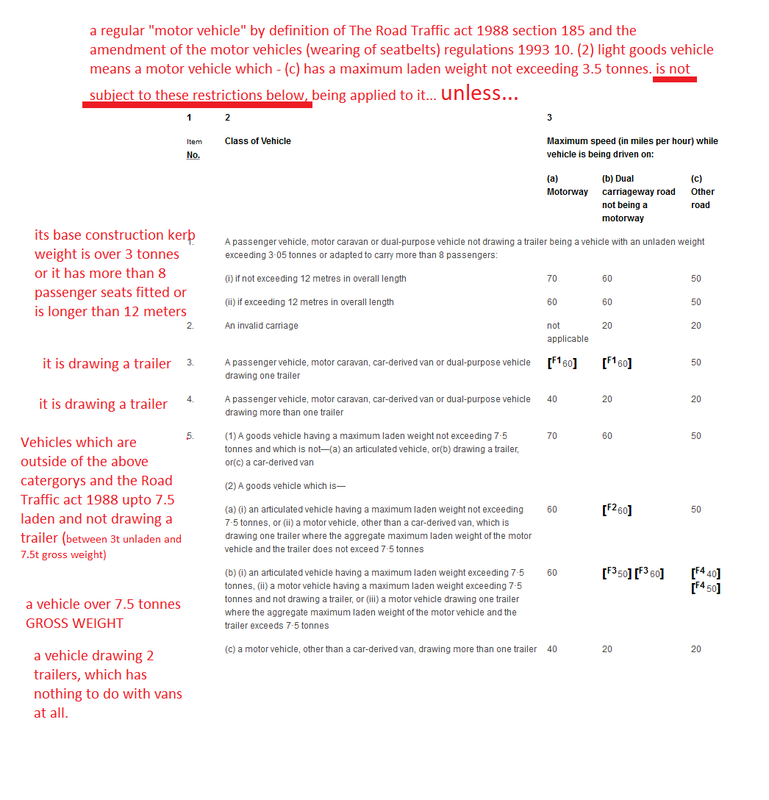 Which have the further car derived van and dual purpose vehicle term added to them... (under 2tonnes) mgw but it does NOT remove that vehicle from its original classification as a "motor car"
Ok so im not understanding that the car derived van is actually talking about "passenger vehicles" like vans converted into a taxi that less than 8 seats. 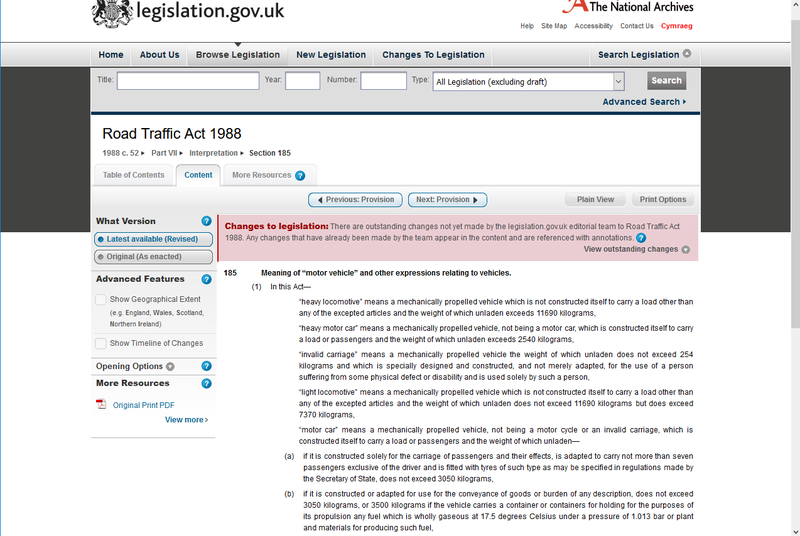 The Road Traffic Act 1988 section 185 , 1 (b) defines the majority of van's currently on the road as a "motor car". So schedule 6 speed limits do not apply to the majority of Vans. "light goods vehicle" (c) means a motor vehicle with a maximum laden weight not exceeding 3.5 tonnes. You also have the meaning of "car derived van" - means a goods vehicle which is constructed or adapted as a derivative of a passenger vehicle which has a maximum laden weight not exceeding 2 tonnes. This in fact is not indicating goods vehicles or light goods vehicles at all, but only ones converted into passenger only vehicles. Just went in to North Yorkshire Highways Offices at Thirsk. Had a proper meeting with Highways representative and it went better than expected. Got home and somebody had mysteriously left the door open.. & Last night i went out.. Got beeped rudely by a guy passing bottom of our drive for nothing when i went out.. Really upsetting as i had just had a very special moment and it completely ruined it. Then.. On my way to where i was going there was a burst water main.. I followed a diversion and it did not make sense.. I went back and had been sent and impossible way.. I think somebody masked a junction up to trick me thus sending me in a figure 8 drive that made me late... Really grr. Hmm. and there was a burst water main apparently from the previous day.. But the route should have been very short. It was impossible for me to go wrong unless something was not as it should have been. Anyway.. Pretty much ruined my special day..
Then a bit better today.. I was going to Newcastle upon Tyne and i decided to go to the North Yorkshire Council Highways Offices at Thirsk. I got to speak to a really great guy and it went very well and he invited me into the meeting room!! And we went through pretty much the majority of things!!! And its turns out as i thought.. I am correct about most things! And this guy is of very similar and same opinion on most things! He also confirms the Highways Agency on me being correct about the van speed limit! But we went through a lot more including the road signs and other things.. I will go into more detail later but i also got to put ideas across as well as we both were of the same opinion of smart motorways being stupid and also of keeping the hard shoulder!! He liked my idea about more exits off the motorways than entrances as well. Instead of smart motorways. We also got to talk about the Ossett bypass europort sign and terminal signs being misleading and somebody doing it wrong on purpose!!!!! 😯 and he thought i was right!!!! We also talked about the magistrates being potentially biased and hearings not being fair as the court is not independent from the safety partnerships. But i really felt it was a huge major progression!! And have gained a lot of insight about the council and police and who they are and how they communicate and their attitudes and opinions..
And i really got along with this guy. He was very enthusiastic that i had got thr manuals and read about it and was like minded! Also it seems the council had to check up themselves on some things the government don't make clear in relation to road planning and building.. And he agreed the dodgy national speed limit signs on tje motor ways were not lawful!! So it seems im right to challenge the government over it. But i myself probably only have the same capacity to complain as the council do.. Earlier on i saw the camera van over the A1 motorway instead of the A19 and it was there last week as well. Looks like maybe a new position? Unless he has been there previous Fridays? Anyway.. I was out on a random road near Driffield this afternoon and saw another silver camera van!! But a female officer was just using it as a police van for Transport!!! I asked if she knew Andy Tooke and she did!!! See was really nice girl! And quite fit too 😂 i told her about my meeting with the council and she said she would speak to Andy Tooke and say she saw me and spoke to me and the council agreed i was right and that the police should withdraw the prosecution!! Oh.. Also talked about the "pollution" excuses the environment agency give rhe Highways Agency for slowing traffic down and he agreed that its a loada rubbish after my example that it creates more backlog of cars and density of traffic that is in fact more pollution that takes longer to dissipate! I think the police are being obstructive and un-cooperative by not providing somebody to speak to me when i go to headquarters. I actually believe the police refusing to meet with me and forcing me into a court room in defence wheni have strong evidence of offences against me is a perversion of the course of justice. But have been trying to get a petition going for the confirmation of the Speed limits for Vans... but its been taking ages.. Anyway.. I didnt update for a while here.. but i went in person to the Department of Transport the other week.. and got to speak to somebody from the "Risk" department.. and i put my representation across.. They then got a guy called "Michael perie" to contact me who is the department of transports policy advisor.. It was quite difficult to get to speak to somebody without an appointment at the Department of Transport, but i managed to ok..
Then, last week I also had a meeting with the ~North Yorkshire Highways department at Thirsk. And the meeting went well.. as they agreed i was correct on the majority of my concerns.. Since i have written again with more clarity to Michael Pierie at the Department of transport... 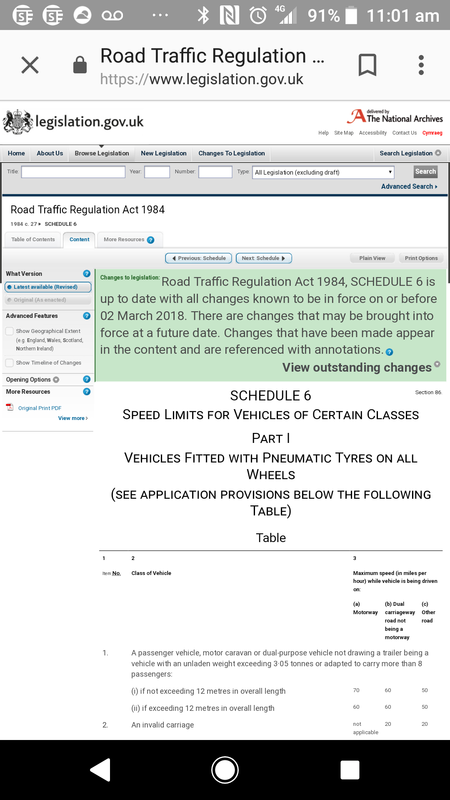 I have not had a direct reply yet, but i have noticed today that the "Legislation" website on the Schedule 6 page is now green and not pink... and its saying the legislation is now up to date.. and its basically the same as it was so no changed on the van/car speed limits... so it is just a matter of correct interpretation as it was before.. I have made another video.. but it seems North Yorkshire police will not speak to me in person when i go in there or they only prove staff who cannot give me a response with administrative authority. Here is a picture of the police video disk i did manage to get which was extremely difficult to obtain.. The video i uploaded already. Here is my most recent comments from noticing the government website being updated. The letter from Northallerton magistrates court came in a letter from Huddersfield. And the recent fine i thought was from Northallerton magistrates court came in an envelope from Scarborough. But my dad has thrown that envelope away. And the fine and points are not from Northallerton at all. They are from Bradford for the Huddersfield Lockwood camera offence..... 30mph speed limit. So what is going on with the A19 Northallerton case? I never received a court summons from Bradford what so ever. Only a letter from West Yorkshire police in Bradford which is not a court at all. The police dont summon you to court. Somebody is playing tricks with letters and envelopes and police and courts. Now i have mo idea what is happening. Same with the signs on the motorway.. I have seen signs saying the motorway is closed when it was not at all this morning.. And signs and displays have been switched on and off strangely on the motorway live while i have driven past... For no reason.. The Highways Agency do not deem it anything out of the ordinary.. So what can you do when complaints have no effect ? Also i think somebody has been in our house swapping letters and switching things around because that camera charger i could not find suddenly appeared in my room and either of my parents put it there.. Somebody either took it and then returned it which is why i could not find it..
Or else got it from where it was and put it on top of the box and things where i saw it where it was not before. Also that glove that dissappeared and re appeared..
And my credit card i just lost and found it on the floor in the car park but i am certain i did not drop it.